Now that The Empathy Exams, the thoughtful, brave, and honest essay collection by Leslie Jamison, is a New York Times Bestseller, it’s probably a good time to start my bragging: Leslie and I smoked weed together at Iowa. I bring this up not (only) to embarrass Leslie (and me), but also because one particular memory of her from that era remains distinct in my mind, and seems appropriate given that her work is so deeply felt and observed, beautiful as poetry and as probing as a deep sea satellite. In the memory, our mutual friend A. has just gotten us high. He is a former journalist and a budding playwright as well as a fiction writer, and so social engagements with him carry with them a certain intensity, as if we’re not just hanging out, but being interviewed and excavated, the performative elements of our personalities both applauded and questioned. I cannot get enough of hanging out with A. Once we’re all rightly stoned, he asks me and Leslie how we might define the word dramaturge. In my memory, my brain stutters and stalls like a rusted old car; I am wishing for some cinnamon bread. “It’s…uh…,” I say, “…like…um…someone who helps a theatre company?” A. nods at me (with pity, I recall), and then turns to Leslie, whose arms are crossed. She’s squinting. Leslie is one of the smartest people I’ve ever met, and when I am high this frightens me a little. “I like to think of a dramaturge as a kind of translator between the text and the performers.” She goes on to describe the art of play production with such elegance and intelligence that I can’t help but feel humbled, jealous, and inspired. This is how I felt reading The Empathy Exams. In a world where there are a hundred online quizzes along the lines of “Ten Things Not To Say to ___________” and twice as many confessional essays that read like ineffectual diary entries, it’s energizing to find a collection like Leslie’s, which engages seriously with issues of pain, suffering, and human connection and interaction. She is a translator for experiences I’ve had but could not find the right — or any — words for. She was kind enough to answer some questions for me via email. The Millions: I’m woefully ignorant when it comes to the essay form. Can you recommend 3-5 books for a reader who wants to immerse herself in this genre? How have these books informed your own work? Leslie Jamison: Boys of My Youth, Jo Ann Beard: Essays about boys, sure — and even a disintegrating marriage with one of them — but also about violence and squirrels and weird attachments that show up with unexpected intensity in unexpected places. Beard takes her pain seriously but is also funny, which I like. “The Fourth State of Matter” (about a mass shooting at the University of Iowa) is one of the most powerful essays I’ve ever read. The White Album, Joan Didion: A classic. But whatever. It’s important, and so good. There are meaningful flashes of personal crisis and reaction amidst larger meditations on the chaos and ferment of the 1960s: Charles Manson, the Black Panthers, the California Water Authority. Didion takes on the world without trying to solve it; she honors the mess. This is Running for Your Life, Michelle Orange: Imagine a woman who writes an essay about Ethan Hawke’s face but also goes to Hawaii to report on the annual conference of the American Psychiatric Association. This collection is cultural criticism that’s roomy enough to hold surprising pockets of deep feeling, and sturdy enough to launch rigorous intellectual excursions. Notes from No Man’s Land, Eula Biss: These essays weave together history and private interior life in extraordinary ways. It’s just electric to watch Biss’s mind and heart work through difficult questions about race and American identity — her writing is lyrical and associative but always charged by ethical concern. A fragmented history of the telephone poll becomes a charged history of racial violence. Biss asks her readers to be fearless and open and willing to encounter difficulty. Some of these collections are more confessional than others, but all of them explore loneliness in ways that feel generative rather than just deflating, or solipsistic, and they offer visions of the ways that private feeling can charge and inflect the way we see the public world. Didion bleeds private and public in ways that have been formative for me. Orange is tender with the absurdities of the world. Biss thinks about guilt and privilege in ways that feel invested but don’t get utterly exhausting. Beard is brave enough to summon the past — and live there for long stretches of time — without apology. I promise I read men, too. And even admire them. TM: Maybe because I met you in grad school, when we were both (ostensibly) fiction writers, I’m curious about your omnivorous writing life. How does fiction writing differ from essay writing for you — in process, in aesthetic goals, in voice and style? LJ: Essays tend to happen in extended bursts — a few weeks, a few months — while the novels I’ve written (one completed, mostly discarded attempts) were long-haul treks. Even the essays that took several years to write and re-write were largely generated in bursts, and then revised in bursts; I sink deep into something, but the horizon of surfacing is never entirely out of sight. In terms of big aesthetic goals, I think there’s a lot of overlap between my fiction and my nonfiction — or at least, in my aspirations for what both might do: go deep into consciousness (whether an imaginary character’s, a real person’s, or my own) and excavate moments of surprise and awe and tenderness and hurt in that consciousness, and in its interactions with the world and with others. But that excavation happens so differently in fiction and nonfiction. In my nonfiction — especially reported pieces — more of the work happens away from the computer: getting on a plane, recording an interview, exploring a place and writing down everything I see. These parts of the process — that feel exploratory and experimental and tactile — are part of what drew me to essays, offered a relief from a flailing second novel that had started to feel claustrophobic and contrived. Nonfiction makes me nervous in so many ways that fiction doesn’t: I get nervous about interviews (standard-issue holdovers from social anxieties of a younger self); I get nervous about upsetting the people I write about; I get nervous — of course, and I hope productively — about getting things wrong. All these kinds of nervousness make me sweat, but they also keep things electric. TM: In a piece for Publishers Weekly, “How to Write a Personal Essay,” you write about how personal experiences sometimes don’t fit into a larger piece: “I can’t fake connections; I know readers can smell it — the faint stink of forced correspondence.” You mention a “purgatory file” where you keep “every shard I can’t bear to throw away; so that I can resurrect them from the dead if opportunity presents itself — if I see how these old shards can do the work I need them to.” I wonder about this file. How extensive is it? I feel a longing for a Leslie Jamison scrap-heap of cast off material, maybe because I feel like you’d do something intriguing and thoughtful with it. Have you ever thought about building something from the shards alone? LJ: Amazing question! Totally a question from one writer to another. Do you have a purgatory file, too? Do you call it something else? I actually have a bunch of these files, attached to separate projects. And yes, I have tried to work with the shards. There is one period of my life that I’ve tried to write about over and over again but never managed to capture, and my latest attempt was a kind of meta-essay that gathered together all the previous attempts — everything from early diary entries to old term papers, but mainly scraps of discarded essays from the past ten years — and basically making a collage of excerpts, all distinguished by font. I wanted to give a sense of the layers, the ongoing process of returning to something that’s been hard to narrate. I wanted all the fragments to give a sense of difficulty but also desire — the deep, ongoing desire to honor this part of my life. TM: When I read these essays, I kept thinking about your inclination to problematize: your experiences, your feelings, essay writing itself. If that sounds like it has a negative connotation, that’s not my intention — I admire your striving to see everything from numerous sides, to investigate your own desires and motivations, and to remind your reader that the essay form should be interrogated and upended. Was that a goal with this collection, or did that just…happen? Do you think it’s the writer’s — or the essayist’s — responsibility to problematize? LJ: If “problematize” means regarding a subject from multiple angles, confessing the bias intrinsic to my subjective position, and questioning my own assumptions — then I suppose there’s no way I wouldn’t; it’s just the texture of how my mind approaches anything. And insofar as the essays are approaching a central subject — though they all come at empathy from different angles — they’re also looking to find the complications and perils embedded in what we might be tempted to view in simple terms: empathy as unequivocal good, unequivocal gift. But I’ve always thought of this kind of problematizing as a fundamentally recuperative gesture: if we see something as fully as possible, in all its flaws and troubles, we can pursue it and embrace it more fully as well — there aren’t secrets or dangers festering under the surface. I’m wary of saying that writers have an obligation to do anything in particular — most often, you’ll find someone who doesn’t do whatever thing so beautifully that they redeem its absence — but it’s hard to imagine an essay that would be satisfying without complexity, and it’s hard to imagine complexity without some version of what we’re calling problematizing: the negative capability of holding multiple possibilities at once. A quick note on upending the essay form: In all honesty, I think that the “essay” genre has already been taken in so many fascinating directions — followed down so many engaging formal back roads — that it would be disingenuous and a bit hubristic to claim that I’d upended anything: with the essay, stylistic innovation is more like continuing the tradition than upending it. 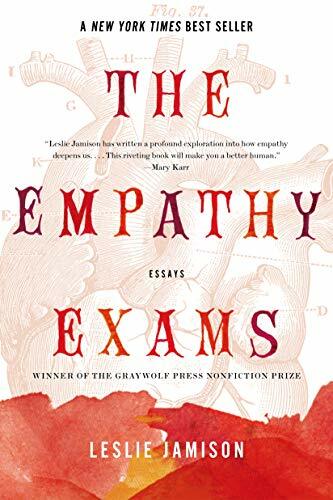 TM: Olivia Laing gave The Empathy Exams a very positive review in the New York Times Book Review. She had one quibble, however: “These are the essays of a working journalist. Most have been previously published in magazines like Vice, Harper’s and Oxford American. Because they all work to some degree over the narrow field of personal experience, they inevitably turn up the same items of autobiography, perpetually introduced as if for the first time. This has a strange, unwitting effect in a book so preoccupied with the registering of and response to distress — it makes Jamison sound self-preoccupied, too caught up in her own stories to recognize that the reader has encountered them before.” I don’t quote this back to you to be cruel, but because I feel like you must have recognized the repetition in this book. It seems to me that the book’s echoes of pain, the repeated acknowledgment of it, is part of the collection’s project: the emphasis and reminder of selfhood and of pain that is revisited but not necessarily resolved. It feels like grief, in this way. Am I just bullshitting here? What’s your take on it? LJ: I don’t think you’re bullshitting! In fact, I’d love to quote you on that. I do mean for the collection to acknowledge the ways that certain kinds of pain must be revisited without necessarily getting resolved. This certainly happens in conversations and in life. I’d like to think that each time I return to any of these “same items of autobiography,” I’m doing something different with it. For example, I mention several times that I was punched in the face by a stranger in Nicaragua — one essay invokes an obscure literary theorist to try to tell the story of this assault in terms of traditional Russian folktales; another uses the assault to describe what it felt like to read James Agee for the first time. I don’t tend to think of autobiography as a finite arsenal of weapons that can get deployed at various moments: here is where I whip out my abortion, my abusive relationship, my divorce — so much as a set of inexhaustible resources; each story from my past — or anyone’s — holding a thousand possible meanings, a thousand possible slants. But I do find it fascinating whenever anyone responds to the collection by suggesting its preoccupation with its own wounds — not because I disagree (I am preoccupied with my own wounds) but because I disagree with leveling this kind of accusation: why shouldn’t we be preoccupied with our own hurt? We should just do our best to let these preoccupations spur us into productive kinds of attention and action. And the final essay in the collection, “Grand Unified Theory of Female Pain,” is about precisely this kind of accusation — what it means to shame women for “wallowing” in pain — so it always interests me to see that phenomenon enacted in responses to the book. TM: There are a couple of comic moments in this book when you mention the way your writing was received when you were a student at the Workshop (for instance, you describe how another student suggests during workshop that you give your main character a job). I’m wondering if you could talk about the workshop process a little — what it offered you and what it lacked. Sharing work for a group critique requires one to be vulnerable, but also, maybe, defiant. What do you think? LJ: I have a lot of faith and trust in the workshop process, largely because it’s a model that can absorb and even articulate its own limitations — can be dynamic, adaptive, try to get better. I think it’s a total gift and privilege to have a roomful of people who care about writing pay attention to yours, and offer feedback — but I think it only works if you can set strong internal boundaries around how much that feedback matters. In other words: don’t let the voices crowd too close, or get too loud. At my first workshop at Iowa, the wonderful Elizabeth McCracken told us that it would be a useful workshop if we incorporated 20% of what we heard — that didn’t mean we were being arrogant, to “disregard” the other 80%, just that part of our job was to sift through the feedback, rather than feeling like it was our task or obligation to incorporate all of it. That was liberating for me, and changed my sense of what a workshop was or how oppressive it had to be. I love teaching workshops because you get so many different voices in chorus. I do think it can be useful — especially with longer projects — to get some distance from feedback for a while, so you can get to know a project — develop a private relationship with that project and follow it somewhere before you expose it to the input of others. I wrote my novel entirely outside the workshop system, after I was done with Iowa, and I think that was important to getting a certain momentum going. I was riding the dream of the thing (sometimes nightmare) without interruptions from other sensibilities. I had to get the whole thing down before I was ready to hear any craft advice from anyone. TM: And, because this is The Millions, I must ask: What’s the last great book you read? LJ: Easy. Just finished it this week. Beautiful Children by Charles Bock. It’s full of harm and care and crisis and bright light and so much filth, and so much beauty, and so much heart. Barcelona is a bilingual city where two languages mix together with no problem, and it’s very common to take part in conversations where every participant speaks in the language he or she finds most comfortable. That’s why I turn to so many words in Catalan: they are floating in the ether. There’s a dwindling number of us who can remember life before the Internet, and there’s almost no one who can remember life before the saturation of television. You mistreat animals, you eventually will mistreat human beings. If you’re casual to animal life you will eventually be casual to human life. The trouble with plots in novels, the resolving kinds of plots, is that they can move in such a dreary groove. One sees the same old thing coming a mile off — after a strong beginning, the novelist allows the plot to write the rest, letting the old, lazy hook do all the work, instead of sustaining the fresh vision of the beginning. This was the most helpful and insightful thing I have read about writing lately! Now I guess I will have to read The Empathy Exams. Because the intersection of life around one with oneself–what else do we write about? I think I have been walking around writing essays in my head but didn’t even know I was doing it. Thanks to both of you. Getting to read two of my favorite current writings talking to each other has just made my day. Thank you. Er, WRITERS. Not writings. Apparently it has made my day but not yet saved me from typos. a.) I always demand dinner, and maybe a movie, before being excavated. b.) Did you at least get some cinnamon toast post-excavation? c.) Upon reflection and review, I have just voted “A”: Person Most Likely To Get Punched In The Face At Bar I Used To Work At.” Just an instinct. d.) Where is Timble? Timble must comment here. d.) Sound horrible, Ms. Lepucki. Advise hanging out at bars where roller derby people and/or longshoremen congregate. More relaxing and great material for your novels. Bragging that you smoked weed with her in grad school? How old are you? I miss when middle-aged writers acted like adults. “I’m not going to win.” Those words came by email from The Lotus Eaters author Tatjana Soli on being shortlisted for Britain’s oldest literary prize. Recent winners of the James Tait Black Award include A.S. Byatt, Ian McEwan, and Graham Swift. Earlier winners read like an all-time literary greats list: E.M. Forster. Margaret Drabble. Nadine Gordimer. Evelyn Waugh. In its almost 100-year history, very few debuts have won, much less ones written by Americans. The Lotus Eaters, as happens so often with first efforts, almost never saw its way into print. The story — about the Vietnam War, told from the perspective of a female photojournalist — was written, and revised, and submitted and rejected. And rewritten. And rejected. And rewritten again. By agents. By editors. Soli was told that Vietnam was considered a niche audience, all military and all male, and that a woman’s perspective, not a soldier’s, would be too limiting. The Lotus Eaters sold to St. Martin’s Press for a modest advance some ten years after Soli first conceived it — and then this quietly understated debut began attracting fans with pretty big pulpits. Janet Maslin, writing for The New York Times the day before The Lotus Eaters was published, called it “haunting” and “quietly mesmerizing” – and that was just the opening two lines of the review. That weekend, it gained raves on the cover of The New York Times Book Review and in The Washington Post. It went on to become a New York Times bestseller, was named a notable book of the year by the Times and the ALA, and was a finalist for the LA Times Book Award. Still, Soli was as surprised as anyone when it was shortlisted for the James Tait Black. Soli is back this fall with a second novel, The Forgetting Tree, about Claire Baumsarg, the complicated matriarch of a California ranching family, and Minna, the enigmatic young woman who comes to take care of Claire as she battles cancer. I had a chance to chat with Tatjana about her second novel, the James Tait Black, and what she’s up to next. The Millions: While The Forgetting Tree is clearly a Tatjana Soli book — the gorgeous language, the plumbing of complex characters in challenging circumstances — it is also a departure from The Lotus Eaters. It’s set in contemporary California peacetime rather than 1970s Vietnam War, and it includes a larger cast of characters. Did you consider doing something closer to the first novel? How did this story come to be the one you chose to write about? Tatjana Soli: I spent such a long time working on the first novel, doing tons of research, that I really wanted to get as far away as possible from both a war novel and a historical one. It was draining subject matter. Although you are writing fiction, there is the additional burden of historical accuracy that also made the writing process less free. I did write more short stories about the war that I couldn’t resist doing, extra material that didn’t find its way into the book, but I knew none of the material had enough heft for another novel. As far as the second book, it’s mysterious how the subject matter seems to pick you, but I live surrounded by the old citrus orchards of Southern California so that setting spoke to me, or rather how those orchards are disappearing spoke to me. I wanted to write about a character who mourns that change and is angered by it. Although plenty happens from the outside, the second book is more character-driven. My interest in the clash and misunderstandings between cultures definitely comes from where I live, and it’s been a huge influence in both books. I think there is the same concern for how one lives in both books. How does one bear witness during war? How does one overcome tragedy in a very personal, private life? Those were issues that compelled the writing. It’s hugely disconcerting that you work blinkered as a writer — thinking you are on to fresh material — only to realize after the fact that you’ve returned to the same themes. I tell my students that you cannot control what you write, but only how you write and communicate that vision. The vision is out of your control. TM: “The vision is out of your control.” I love that, and it makes me think of another parallel in the two novels, which is that the main characters in each — Claire and Minna both in The Forgetting Tree, and Helen, the American photojournalist in The Lotus Eaters — have left the worlds they grew up in to live elsewhere. Place is incredibly important in both novels, too. Not to get all psychobabble about it, but I know your mother immigrated to the United States with you when you were a child. Is that experience, do you suppose, involved in that subject matter choosing you? TS: Well, I don’t want to get psychobabble in reply, but I can’t imagine anything more boring than writing about my own experiences. The way I look at it is that all of us, writers and non-writers, are a product of what happens to us. But for the writer, experience creates unique areas of sympathy. The types of stories that call out to you and not someone else. I was born in Salzburg, Austria, and came to the United States as a child, so being displaced is something that I have experience with, and displacement happens to be a major, worldwide phenomenon of our century. Due to wars, poverty, discrimination, genocide, or even opportunity, for whatever reason, lots of us are far from home, and we are probably never going back. Wide Sargasso Sea is a major text in The Forgetting Tree. I remember my writing professor in college recommending for me to read it. She said, “This book will change you.” I think she meant that you will always question the accepted text afterwards, in this case, Jane Eyre. But what it did for me is make me want to be a writer. I totally got Jean Rhys from the first lines: “They say when trouble comes close ranks, and so the white people did. But we were not in their ranks.” Rhys was always on the side of the underdog, the outsider. She was born in Dominica and spent most of her life in Europe, primarily in England, which she claimed to hate. In the last part of Wide Sargasso Sea, Antoinette’s confinement in England is terrifying. I can picture Rhys reading Jane Eyre the first time and shaking her head: No, this isn’t the way it is. It’s funny because I can put these ideas together retrospectively, but I never was conscious of it as I was writing. Even on my third novel that I’m working on now, I hadn’t thought of it that way, but again it’s about characters far from home. TM: You open The Forgetting Tree with another character far from home in a sense: Octavio, who is if not a Mexican immigrant himself then a man who is steeped in that culture, at home on the farm but not necessarily in the world of the whites who own it. And you make some interesting choices in the book, starting with revealing in the prologue a tragedy that informs the events of the novel — told from Octavio’s point of view. We also see Octavio in the book’s closing, but much of the rest of the story is told from two other perspectives: Claire’s and Minna’s. Was the book structured this way from its inception, or did it evolve in the writing process? TS: Those choices all evolved during revision. During my first drafts, I usually write whatever seems to have heat to it, whatever seems important, even if I’m not sure how to fit it in. My revision process then is a very deliberate distancing exercise — trying to think of how to present what I have to the reader. So I move things around. If I’ve done my job right, I’ve communicated that excitement to the reader. I struggled a great deal with the secret at the heart of The Forgetting Tree, how not to reveal it, and yet not make it a trick, and so the shifting viewpoints evolved naturally. I never outline because the way my mind works, the outline rules out all other possibilities. I’d like to talk myself out of this conviction, but there it is. Lately, I’ve been playing with the idea of shapes, or movements, that represent either the whole novel or a part of it. Let me give you an example. Recently, I read Jess Walter’s Beautiful Ruins, and I thought the ending was magnificent. Afterwards, when I heard him speak, he said he had this idea for the ending of holding these fuzzy flowers, like dandelions, and letting the wind scatter all those little seed heads in every direction. As soon as he said that, I recognized the feeling I got reading that last chapter. Somehow visualizing instead of outlining short-circuits the critic inside. TM: Can you tell us a little about where Minna — who is one of the most fascinating characters I have read in a long time — came from? She doesn’t appear until 100 pages into the book. Was she in your mind when you started writing? TS: Minna was there at the very beginning, but she was such a loaded character that I knew the stage would have to be set for her appearance. Claire would have to have gone through enough and be ready for that relationship. I also knew that she would be hiding her identity. Again, living in a very multicultural area of the country, I see how even open-minded people can live for years around a person from another culture and not understand what their life experience has been. They make assumptions. One example. I had jury duty. The case involved a man from a Central American country being accused of a fairly serious crime by a family from the same country. None of them spoke English well enough to understand the court proceedings, so interpreters were ordered for both sides. Suddenly we get into these long stories told by each side. It seems the man was a type of healer; he talked at length about some of the spells or incantations he performed. Well, the interpreters, the lawyers, the judge, no one knew what to do with this. They thought this guy was crazy. Then it came out that the family had actually hired him as a healer — they accepted the validity of these practices he was talking about. It was part of their culture. The whole case just broke down. The whole apparatus of Western justice fell apart. TM: Fascinating. And The Forgetting Tree is very much about healing, with the tree of the title playing a role. Minna, not long after she meets Claire, calls the farm “a God place” that could heal Claire if she allowed it to. “Maman said trees healed you,” she says. At that point Claire is very skeptical of this, just as I imagine that jury was skeptical, but it isn’t the end of the magic — or the superstitions, anyway. Can you talk about how the “voodoo,” as Claire’s daughter Lucy calls it, came into the story, and what kind of research you did in shaping it? TS: I actually enjoyed the research for that the most. There is a long tradition of Western fascination with vodou rituals, and there are many books about outsiders attending ceremonies, both in Haiti and in Haitian communities in the United States. Of course there are all the silly movies that play up the sensationalistic aspects, and they mostly get it wrong — things like putting spells on people and having zombies running around. I’m certainly not an expert, but mostly the rituals seem to be a combination of Christianity, brought by the French, and African myths and beliefs. During the most oppressive years of colonialism, vodou ceremonies were outlawed because they were a way for the people to empower themselves. I’m not so concerned with questions such as is it real, but rather what is the effect? This was one aspect of the average person’s life in Haiti that they could take pride in. The vibrant Haitian folk art comes from priests and priestesses of the religion. Much of the music is associated with these ceremonies, and protest songs grew out of this tradition. In a country with a high illiteracy rate, songs were the main way to communicate. During the Duvalier years, popular bands would have their protest songs banned. Breaking the ban could mean imprisonment or death. So none of this was the Disney stuff we usually associate with vodou. Minna, of course, grew up with this from a mother who had early on distanced herself from such “primitive” beliefs, but had returned to her roots eventually. Minna, in her survival instinct, uses the accouterments of the religion for her own purposes. Part of it is to make the world around her familiar, part of it is to obscure. TM: Will you tell us a little about what’s next for you? TS: I’m about two-thirds done with my next novel. It’s a comic one about a group of Californians on a South Sea island. I wanted to have a new challenge from the first two books. This is lighter in tone and has a large cast of characters. It’s been a fun experience so far. TM: And will you indulge the rest of us in a moment of living vicariously? What was it like to learn — after working so long and hard on both writing The Lotus Eaters and finding a publishing home for it — that you’d won the James Tait Black? TS: It was an out of body experience to be sure. No one, here or in England, was giving me any kind of odds. My mom and I booked a flight so that we could attend the ceremony because truly it was such an honor just to be nominated. It’s been won by Graham Greene (one of my all-time writer heroes) and D.H. Lawrence, as well as contemporary writers such as Salman Rushie, Zadie Smith, and Cormac McCarthy. Awards are always a lottery, but it was hugely affirming. The honest truth is that once it’s over, you forget about it. You go back and struggle over each page. The writing doesn’t get the least bit easier. It’s like a really incredible vacation — you go return to your real life. The biggest lesson I learned through the whole publication process is that whatever happens, good or bad (and there will always be a fair share of both), you go back to the page. That’s where reality is for a writer. Each project needs to, in some ways, obliterate the previous project, so I've been waiting for the firepower to arrive. The murky area between genres has always been the place where I feel most at home. Doggedness is the essential quality that’s needed if we have any hope to cross the divides that separate us.